Features: USB Dongles - Multiplatform dongle - Uses standard algorithms (AES, RSA, and ECC) to provide maximum security Contains an internal clock and can be connected to the Internet. Large memory and additional flash memory. - Remote update. - Remote firmware update. Description: The idea of the CodeMeter concept is that licenses can be stored for many products even from many different vendors at the same time. 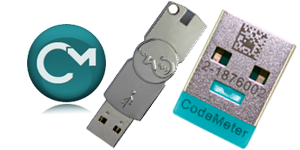 CodeMeter strong crypto algorithms and many different License Options for developers, hovewer API is complex to implement and most developer use only automatic envelope protection or simple dongle presence check.